CDN means Content Delivery Network and it is referred to a group of servers, or computers, located in different places and prepared to receive information and deliver it to other devices. What are the benefits of using Mediastream’s CDN? Our clients forget their latency problems, lost of information or stability, to focus on the content they want to deliver to their users. That's why, as our Mediastream servers are located in Miami, Dallas, Salt Lake City, Washington, Bogota, Sao Paulo and Santiago, with the main ISP (internet providers) in Latin America, the service we provide is safe, fast and the user receives the best video quality in the shortest time. 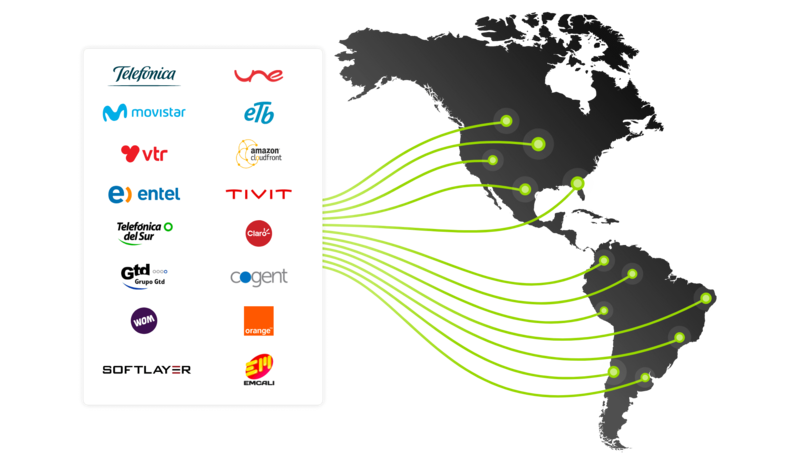 In addition, we have physical presence in Claro, Telefonica, Movistar, UNE, ETB, GTD, WOM, VTR, Cogent, Level 3, Telsur, Entel, NAP Colombia and SoftLayer and we are integrated with Fastly, Akamai, Cloudfront, Edgecast and Level 3 for always guarantee the best distribution and delivery of content. Live broadcasting through our video management platform, with the best quality for every device. Strategic points of presence for the main ISPs in Latin America and the world. You can protect your content with access token, DRM, geo-fencing, network restrictions, by devices or by referrer. Integration with our platform, with which you can manage content, statistics, integrate advertising and payment methods. RTMP and HTTP intake protocols. HLS, HDS, Smooth Streaming and MPEG-DASH output protocols. Delivery of your content with up time over 99.9%, secured by monitoring systems 24 hours a day.